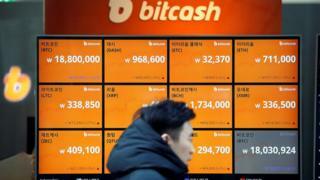 South Korea's spy agency believes that North Korea is behind hacking attacks on a crypto-currency exchange in the South, sources say. At least $7m (£5.25m) in digital money was stolen in the hacks - although the money is now said to have ballooned in value to $82.7m. Based on recent trading volumes, Bithumb is South Korea's biggest and one of the five largest in the world. Analysts say North Korean hackers may have targeted crypto-currencies in order to evade the financial sanctions imposed as punishment for the North's development of nuclear weapons. This attack is said to date back to February, when a Bithumb employee's home PC was targeted - though it was only discovered in June. The hackers also demanded a further $5.5m from Bithumb in exchange for deleting traders' personal information, said reports. At present, virtual currencies are not regulated by South Korea's financial authorities but they are now vowing to toughen up regulation. Three days ago the government imposed fines totalling $55,000 on Bithumb over its failure to protect users' information.